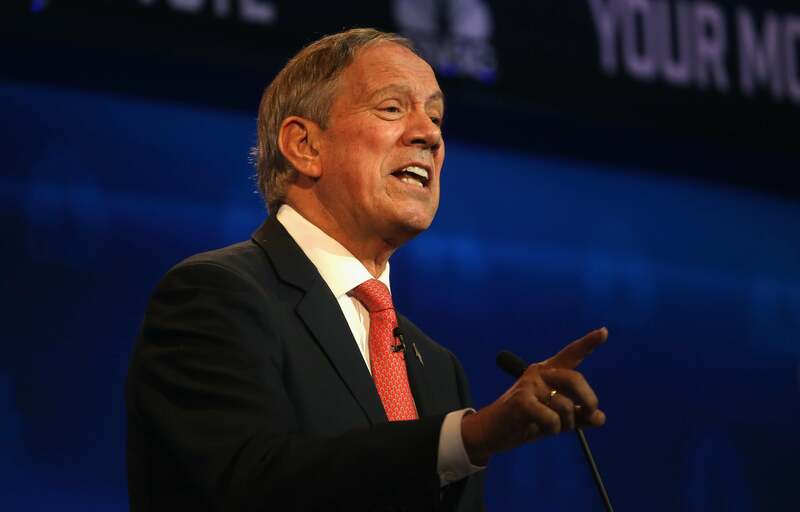 George Pataki ends Republican campaign for president. George Pataki debating during better days. Former New York Gov. George Pataki told supporters he is ending his low-key campaign for president Tuesday. The three-term governor announced on Twitter Tuesday evening that he woud be making a “special announcement” to supporters in Iowa, New Hampshire, and South Carolina and followed up with a video Tuesday night suspending his campaign. After nearly a decade out of office, Pataki joined the crowded Republican field in May. A moderate Republican in support of stricter gun control laws, abortion rights, and environmental conservation, Pataki was cut from a mold of GOP candidates now far out of favor with the party’s ideologically purified base. Unsurprisingly, Pataki’s support in a GOP field that has trended more and more bombastic by the day hovered around one percent and his fundraising never got off the ground. His most recent financial disclosure, ABC News reports, showed Pataki had raised $134,000, a nearly non-existent sum in modern politics. The former governor staked his longshot hopes on the independent-minded voters of New Hampshire, but never made an impact in a race that has conflated hyperbole with reality on a range of issues, most notably immigration. Pataki still showed up to make his case during the undercard debates of the double-digit GOP field, but when Fox Business Network announced a higher bar to qualify for its next debate, Pataki was eliminated from the televised sparring sessions altogether leaving him without money or airtime to appeal to voters.